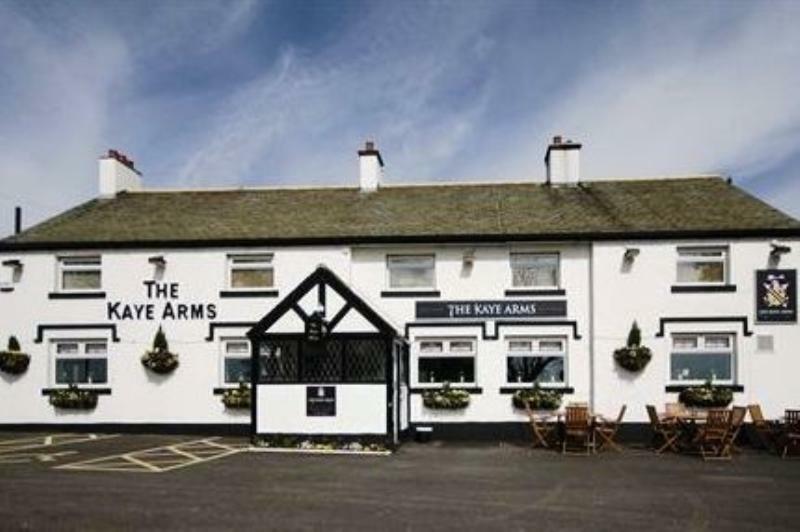 Standing alone on the Huddersfield to Wakefield road not far from Claphouse Colliery Mining Museum, the Kaye Arms is the latest venture of Tim Bilton who featured on BBC2's Great British Menu. Owner of the award winning Butcher's Arms in Hepworth, he has bought this much loved local pub with his head chef Chris Kelly. The interior has undergone a sympathetic refurbishment with comfortable sofas with cushions and beautiful artwork on the walls. The kitchen makes admiral use of locally sourced products for modern menus with a strong British slant. Typical offerings on the regularly changing carte might include a warm salad of smoked bacon, roast black pudding, cherry tomatoes, and soft boiled quails eggs and roast button mushrooms, followed by a main course of North Sea bream fillets, buttered spinach, mash, king prawns, shellfish and tomato bisque. Desserts bring on board delights like white chocolate parfait with warm anise, caramel sauce and dark chocolate crumb or a warm cherry and cranberry Bakewell tart with vanilla bean ice cream.